Do you want to increase your probability of hiring the right person for the job? Hiring best-fit employees is a critical task but it doesn’t need to be daunting or complex. 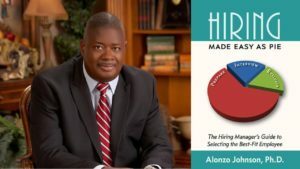 In this how-to guide for hiring, Dr. Alonzo Johnson presents his perspective on best-fit hiring using PIE as an acronym-Prepare, Interview and Evaluate. This straightforward approach is based on his extensive research on hiring practices and years of hiring experience in the business world. He has synthesized his knowledge into essential learnings for anyone who needs to hire someone to fill a position. Dr. Johnson’s hiring approach is easily learned and applied as an effective and structured process. The book offers sample interview questions, ready-to-use forms and other hiring tools. With this book as your guide, hiring can be Easy as PIE. I had made progress writing my book before I was introduced to On Your Mark by a friend. After reading Cathy’s book, I realized I had been rudderless and needed to refocus my writing. The strategies presented in her book showed me how to refocus and finish my manuscript on schedule. Then Cathy stepped in to personally coach me through the maze of publishing. Cathy’s coaching helped me cross the finish line and made the journey fun! To order Hiring Made Easy as PIE click here.